Sooke and Victoria's weather has been pretty marginal lately with cold temperatures, too much rain, and way too much wind. But the fishing has been pretty good, for those willing to brave the seas. 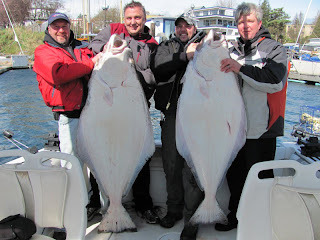 Here's a group of happy halibut fishermen back from a trip with Gord from Foghorn Charters. Gord says "they are happy for two reasons, first their catch and second being back at the dock. The weather wasn't too great, but you work with what you get and do your time for some rewards". Wise word from a good fisherman. Also some good reports of salmon fishing around Sooke and Victoria, with some nice hatchery fish (keepers!) in the teens. So keep an eye on that weather, and get out and catch a fish!